I first met Savitha a few months before her big day. 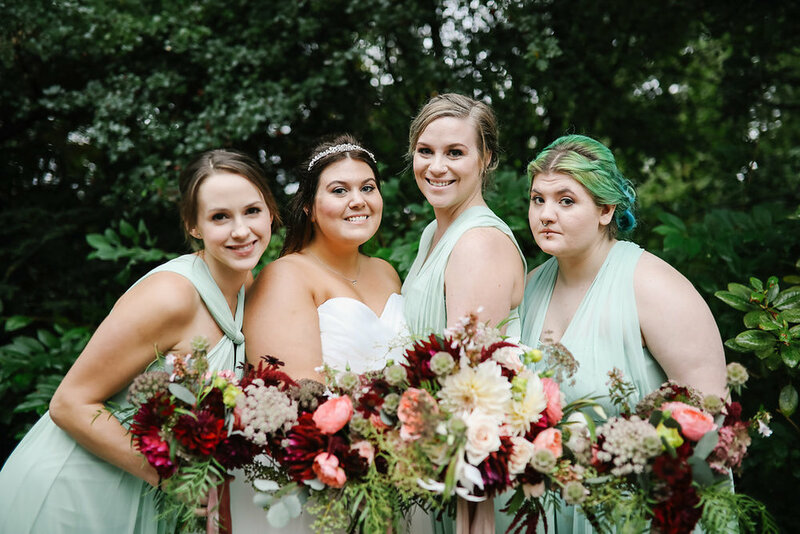 She was one of the most calm and relaxed brides I have ever me. 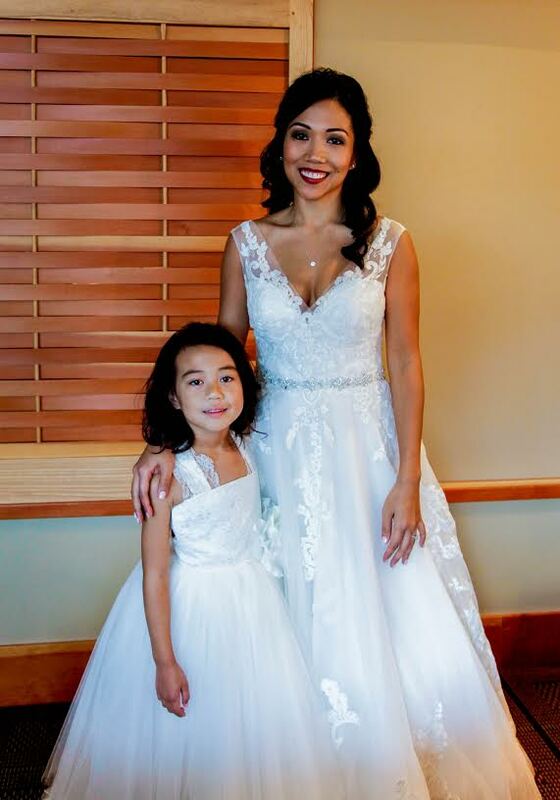 She wanted to keep the entire weekend of celebration stress free and uncomplicated for both herself, her finance Ted, and their families. 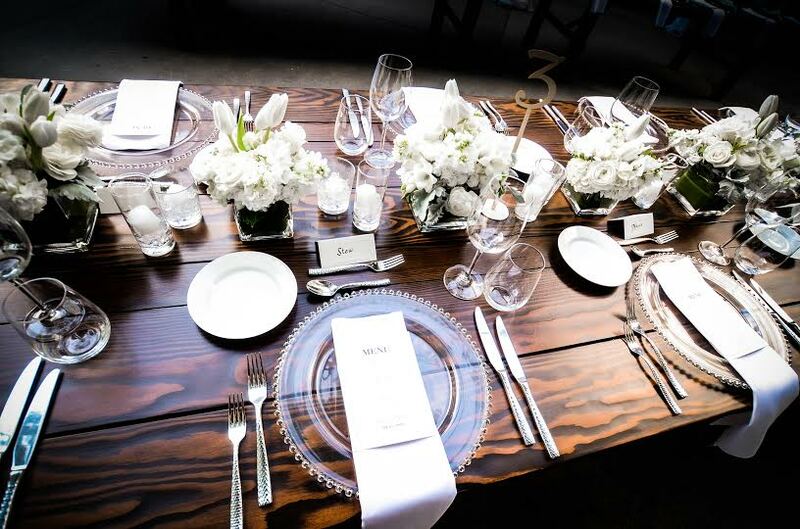 JM Cellars was the perfect venue for the style of wedding they were looking for, laid-back elegance. 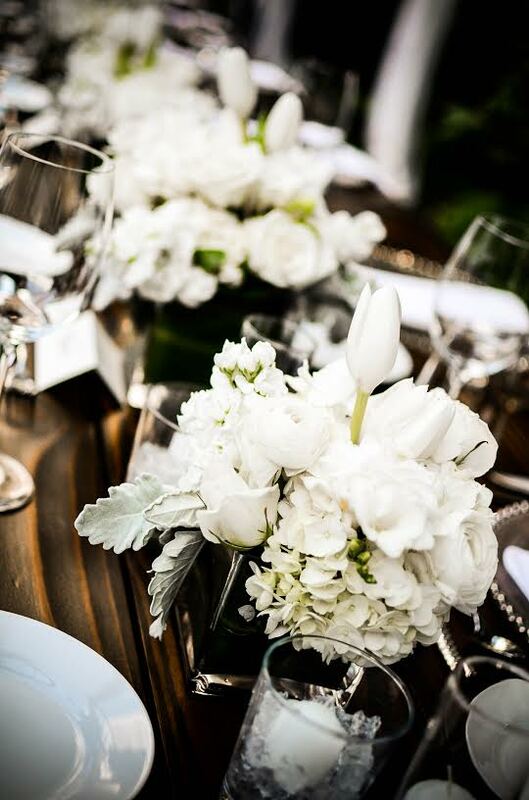 Savitha chose simple details to enhance the beauty of the space, selecting locally grown flowers and romantic color palette. Stadium Flowers added gorgeous flowers to the arbor where Savitha and Ted said their I-Dos. My favorite moment (as it frequently is) was watching as the ceremony came to close, joining not only the couple in this case, but also their families, with five kids between them - such a special moment for them all. Following the ceremony guests were welcomed to the rock garden for wine and bites provided by Herban Feast before moving into the Wine Library for dinner. Guests dined, and listened to heartfelt toasts before moving into the barrel room for dancing! Although it was a cooler than anticipated summer evening the room was kept warm by the very full the dance floor and celebratory energy. Congratulations Ted & Savitha, and thank you for allowing me to be a part of your special day! After an unseasonably cool, rainy week, it was the perfect northwest summer day for Cindy & Tim's wedding at JM Cellars in Woodinville. 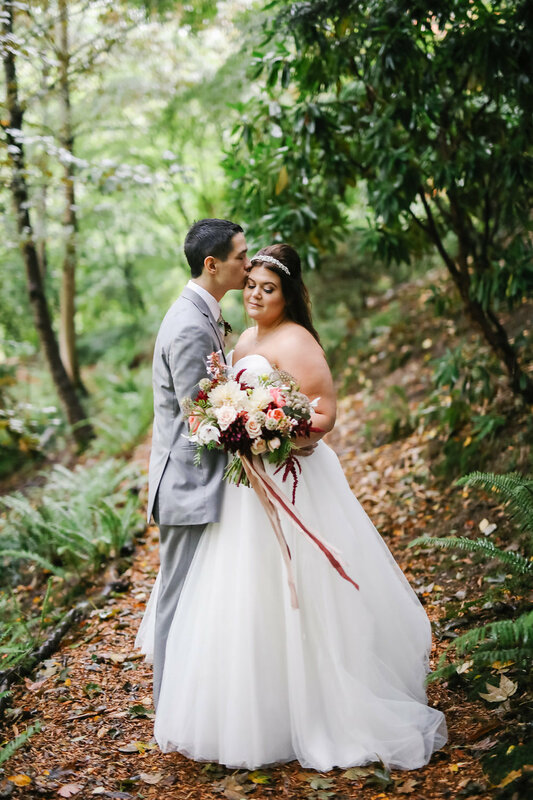 Their ceremony was surrounded by greenery, casting the perfect amount of shade from the warm August sun. 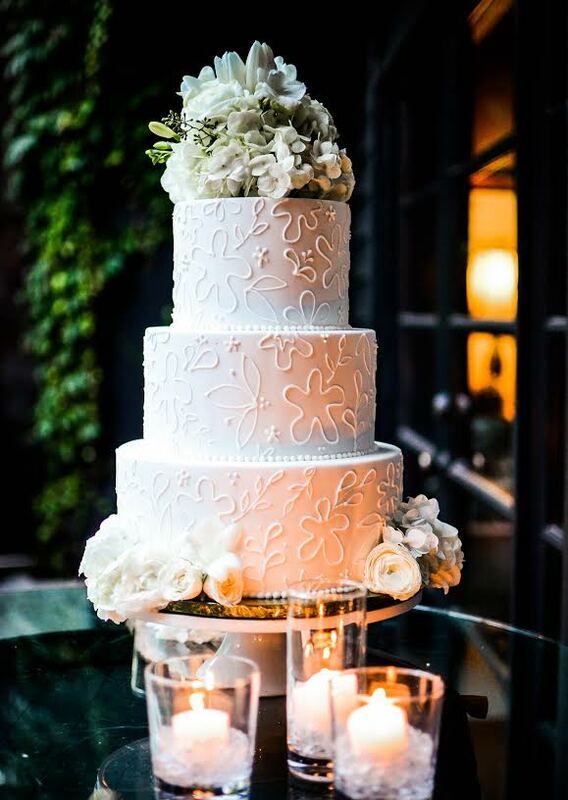 The aisle was marked by white, candle-lit lanterns and the alter was perfect draped in cream and blush linens, in keeping with Cindy's soft color accents. 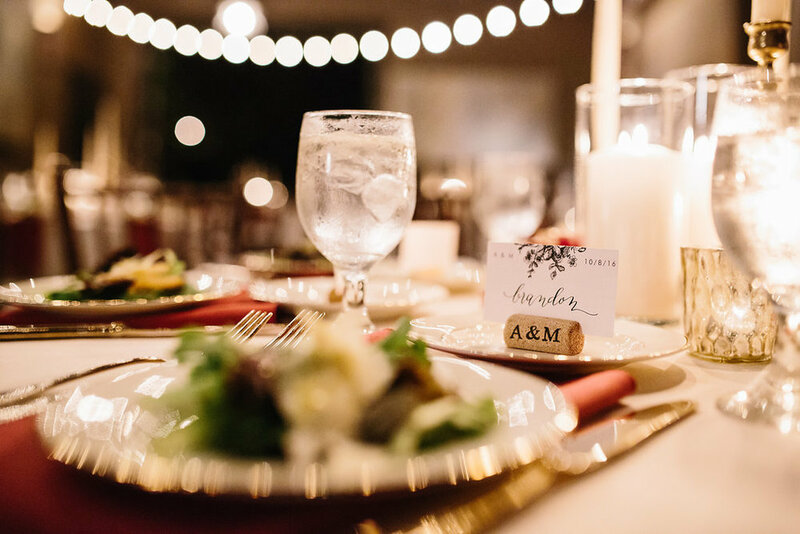 The cocktail hour and reception featured subtle farmhouse style accents, with wine barrels used as glass topped tables and long, dark wood farmhouse tables. 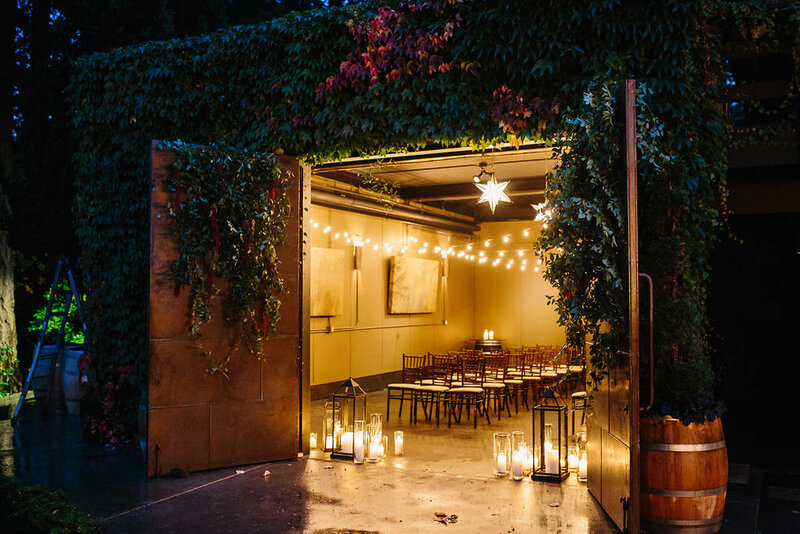 Rustic, vintage-inspired chandeliers were brought in to cast a beautiful dim lighting in the barrel room for dinner, where guests enjoyed thoughtful toasts and an array of JM Cellars best wines. Cindy and Tim and their guests danced the night away with the barn doors open, allowing guests to flow from the dance floor to the patio lit by bistro-lights and under the stars as they wished. Best wishes to the newlyweds! 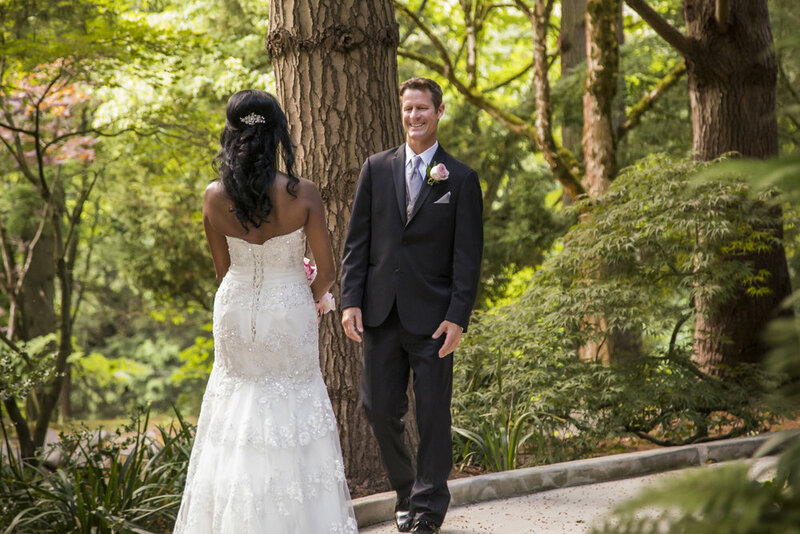 JM Cellars was the perfect venue for Amber and Michael's romantic fall wedding. 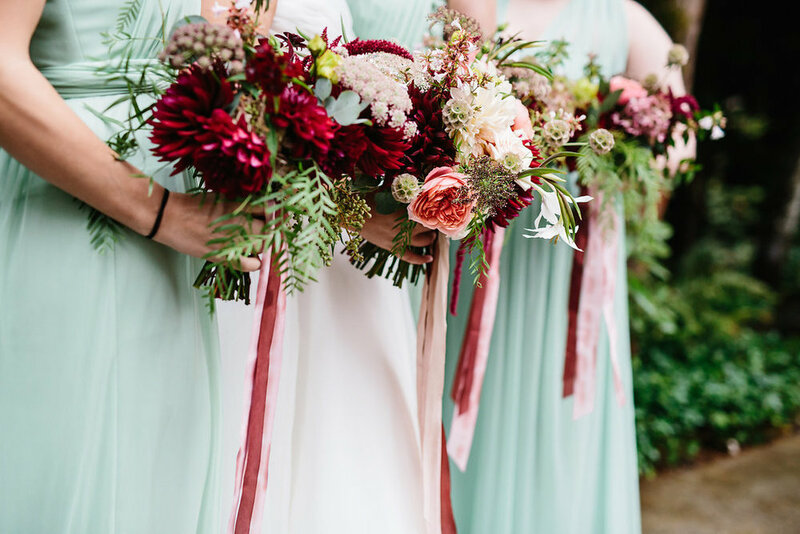 From start to finish this couple knew they wanted to embrace the intimate winery feel as they incorporated berry hues, subtle details and an inviting feel, into their special day. I had so much fun bringing this vision to life with them! The barrel room was decked out by Eleanor of Bash and Bloom. Guests entered into this already beautiful room only to be wowed by a greenery installation covering the copper doors, candles and twinkle lights dimly illuminating the space. 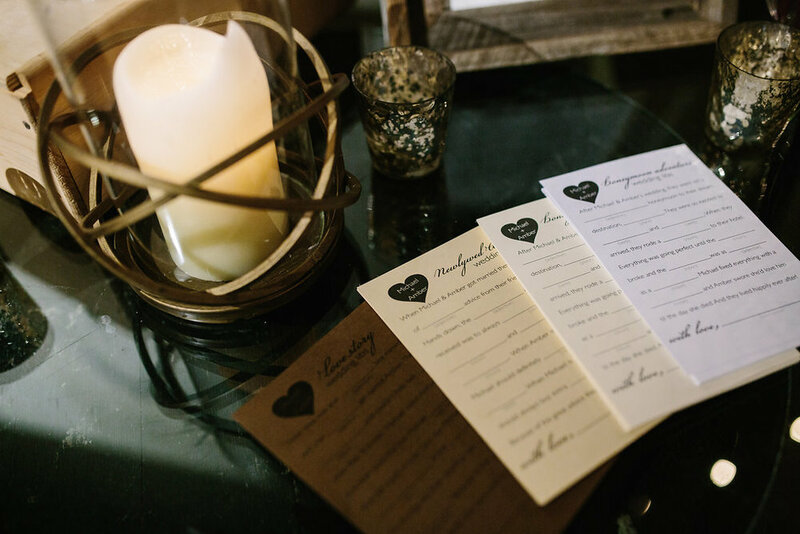 Following the heart-felt ceremony performed by Pastor Dave, the green doors opened for guests to join us in the tasting room for wine and appetizers. Amber and Michael opted to forgo tradition, and shared their first dance away from the guests - a special moment for them both. This also was the only dancing at their wedding, as dinner and spending time together with family and friends was the priority for this couple. 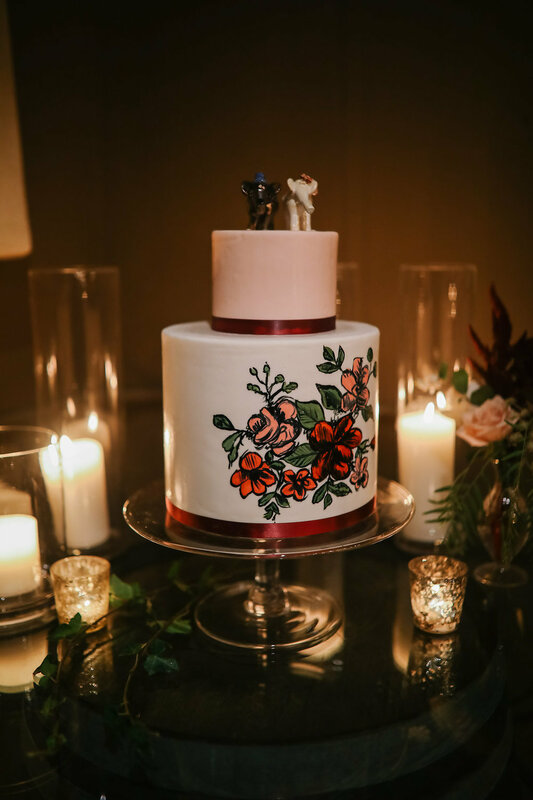 Guests enjoyed dinner presented by Seasoned in Seattle, a gorgeous cake by Honey Crumb (check out the hand-painted flowers by Carla! ), and of course wine by JM Cellars. We also had a few fun surprises as well - wedding mad libs, The Snap Bar's photo booth, and a table of sweet treats (Honey Crumb). Although unplanned the constant rain that kept us on our toes all day only added to the beauty of Amber and Michael's celebration. The trees sparkled, and the soft pitter patter against the winery roof complemented the intimate fall feel we had all dreamed about. 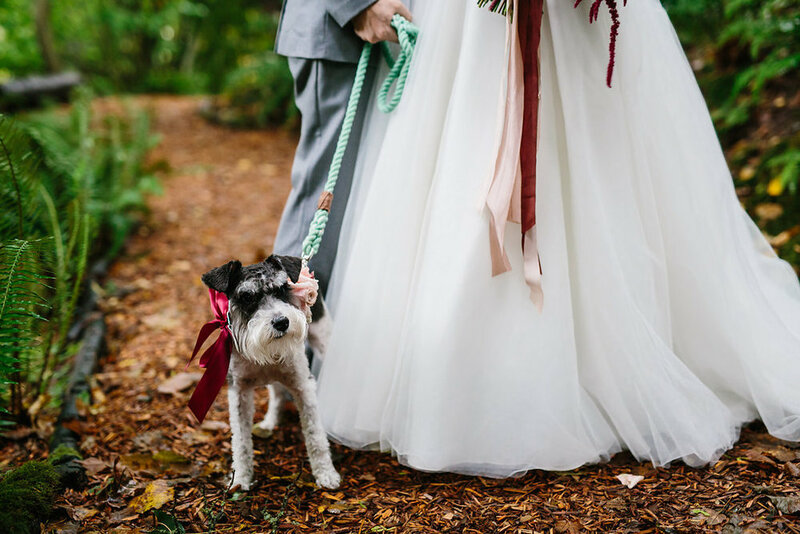 Congratulations Amber and Michael (and new pup, Henry!) - thank you for letting me be apart of your special day! 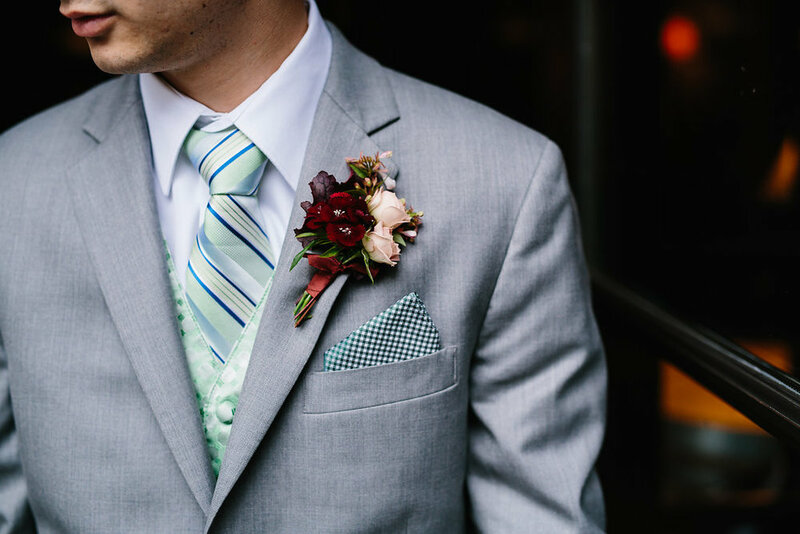 It was an honor to help both Tara and Derek plan their Labor Day Wedding last September. 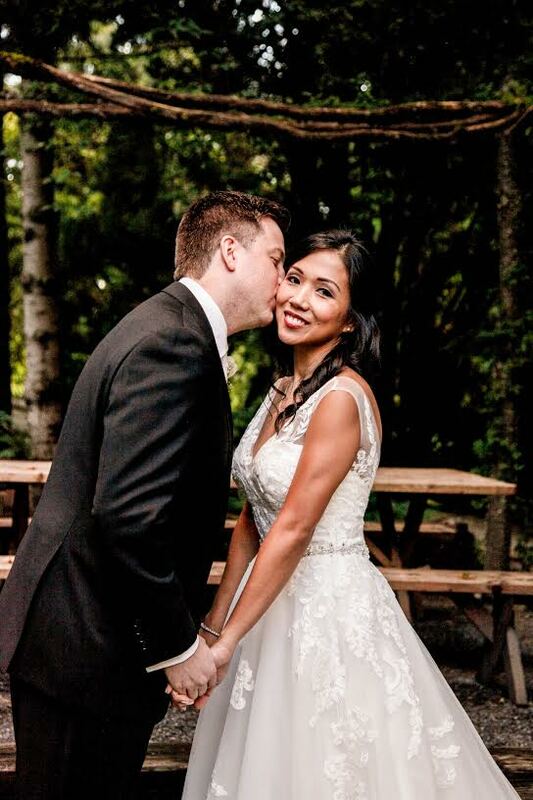 I first met this lovey couple just months before the big day at the venue, JM Cellars. 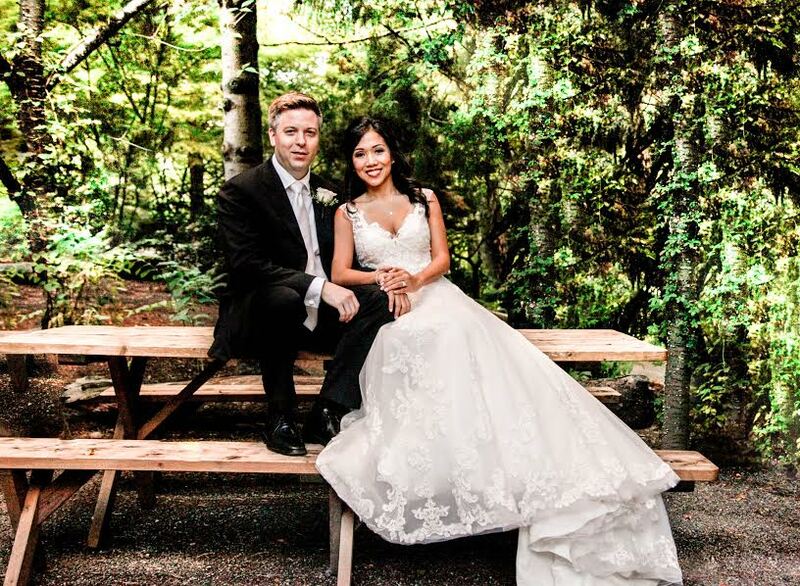 Although it was the 'first date' we immediately connected, and I knew how special their wedding was going to be. With just weeks between our initial meeting and September 1, we got right to planning! Tara and I spent a lot of time talking about how she and Derek wanted the wedding to feel special for the guests, as many would be traveling to Seattle for the celebration. 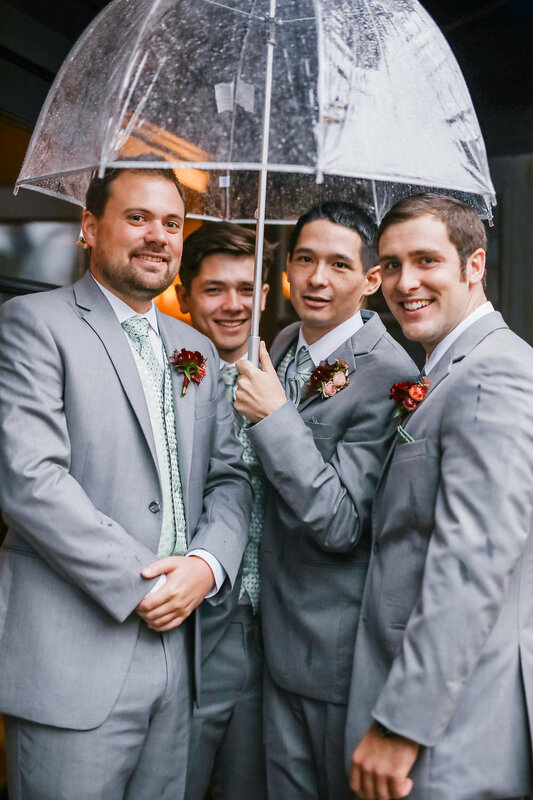 We took every opportunity to make their friends and family feel at home, starting with a glass of wine before the ceremony, and a personal welcome from Derek. He thanked each guest for coming, before taking his place in the candlelit barrel room, a sentiment of warmth that carried throughout the rest of the evening. Then among thirty-five of their family and closest friends Derek, Tara, and Tara's daughter, Lana (officially) became a family of three! Following their touching ceremony, Lana, Tara and Derek proceeded back down the aisle, while guests were surprised with 'reception reveal' as the barrel room doors, which served as the backdrop for our ceremony opened up to a spectacular setting - a clear-top tent for dining, a rock patio for drinks, and live musicians, from the Ekstead Group. After a lively cocktail hour guests moved into the tent where they were treated to an amazing dinner presented by Barking Frog, and a second live band, Still Blue. And while our 10+ crowd (also know as the 'grown ups') enjoyed time with the new couple, our smallest guests, including flower girl - Lana had their own table. Not only did they dine on a kid friendly menu, they also were treated to interactive place settings! Glow rings, coloring books, and sweet treats kept these littles busy! Still Blue played for the remainder of the night, while guests enjoyed a first dance, cake, and spending time together. Although we were not anticipating such chilly temperatures during Seattle's typical Indian Summer, (heaters, blankets, pashminas, and red wine were all musts!) it also encouraged guests to stand a little closer, creating a cozy (almost) fall feel. The night closed just as it had begun, as Derek and Tara did not let one guest leave without a thank you and a warm embrace. It was the perfect close to an already perfect night. Congratulations Tara & Derek, thank you for allowing me to be a part of your special day!